Just weeks after the successful conclusion of discussions with property owners at Ayr’s pink buildings, work to transform the iconic ‘Gateway to Ayr’ is now underway. Contractors are on site, with scaffolding being erected marking the start of the comprehensive conservation and refurbishment programme. Buildings at 1-3, 2-6 and 6a-10 New Bridge Street, comprising a total of 12 flats and five shop premises will be transformed under the initiative, which will preserve their special historic and architectural character. All works will be undertaken using traditional methods and materials, while ensuring they can enjoy a sustainable future. Immediate works will include the removal of old paint and sealing cracks, rendering, window replacement and new roofing. The refurbishment work forms part of the £2.5 million Ayr Townscape Heritage Initiative (THI) – funded by South Ayrshire Council, the Heritage Lottery Fund (HLF), Historic Scotland and owner contributions. 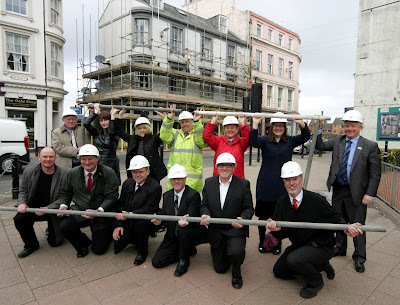 Councillor Bill McIntosh, Leader of South Ayrshire Council, said: "I'm delighted work has begun on the buildings and I’m looking forward to seeing these iconic buildings fully restored to their former glory. “They’re an eye-catching and important part of Ayr’s architectural history and will soon once again grace the Gateway to Ayr, giving our town centre a boost as we work to regenerate and adapt to challenging times. “We recently hosted a town centre summit and it is clear that a vibrant town centre is at the heart of a healthy successful community. Councillor John McDowall, Portfolio Holder for Sustainability and the Environment, added: “The Ayr THI refurbishment works will give a new lease of life to these fantastic buildings and set the tone for anyone entering the town. Not only will the character, history and essence of the pink buildings be retained, the works will give them a sustainable makeover, making sure their iconic status is preserved for many more years to come." Thomas Knowles, Deputy Head of Investment at Historic Scotland, added: "The iconic pink buildings in Ayr form part of its history and heritage. We are pleased that our grant will help preserve them for future generations to enjoy." The Ayr THI work is expected to complete before the end of 2014. • Removal of the existing paintwork, which is cracked and peeling in many places. • Repointing and stonework repairs to improve the external condition of the masonry and to prevent water penetration into the buildings. • Roof repairs and replacement, where required. • Renewal of downpipes and gutters to improve rainwater disposal. • Lime rendering to protect the walls of the buildings. • Window repairs and replacement, where required.